When my Garmin died the second time, I was travelling away from home. I had noticed that some people use a smartphone cycling app to record their ride directly on their phone, without a dedicated GPS device, like a Garmin. I got out my phone, connected to a WiFi hotspot, downloaded the Strava app, and decided to gave it a try. 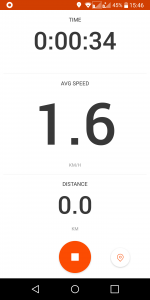 The first time recording a ride using a smartphone cycling app on my phone was a disaster. After recording for a few minutes quietly in my jersey pocket, the phone went to sleep and the app stopped tracking me. When I took it out a little later to check what was going on, I woke it up. Right before my eyes, it updated my location and drew a straight line from where I had been when it had gone to sleep to where I currently was. Impressively, it said that I was averaging 237 mph on the ride. At that speed, I set some unassailable KOMs (“King of the Mountain”). On the other hand, it would likely raise more than eyebrows on Strava. It took some trial and error, and a little online sleuthing, but I discovered that when the device went to sleep some apps would stay awake, and some not. More investigation revealed a setting to keep Strava, or a second app I was trying out, RidewithGPS, awake. In the Android 6.0 vernacular, I had to turn OFF battery optimisation for both apps. That done, next ride, the smartphone cycling app tracked my progress with no hitches. There is actually one big advantage to using a smartphone cycling app for tracking your rides. There was no need for the tedious process of “uploading” the track after the ride. Whether sending from the Garmin to Strava, RidewithGPS, GarminConnect or any other online site. That is because when I tell the app that I am done with the ride, it saved the track to my online account immediately (assuming it had some kind of data connectivity – WiFi or mobile broadband). That is a lot less fuss than plugging in the Garmin to a USB port on my computer, copying the .fit file and uploading it to Strava, or where ever other site I might use. In fairness to Garmin, I insisted on doing it the hard way. You can configure the device to send the track to GarminConnect via WiFi. Then you can configure GarminConnect to pass the data on to Strava, RidewithGPS or other online services. For various reasons – but mostly because I do not like linking my online accounts – I had never bothered with all that configuration. When the USB port on my first Garmin 1000 packed up, I was unable to retrieve the tracks that I had not already uploaded to my computer. The WiFi was working, but you cannot verify the configuration without the USB port. “Sorry,” Garmin support told me, those tracks are history. Back to my situation where I was travelling and found myself suddenly Garmin-less. After a couple of missteps, I could now reliably record my rides using a smartphone cycling app. But since I was travelling, what I really wanted was a way to navigate some new routes. I am used to either plotting the routes myself or finding popular routes online. Google Maps could provide some form of navigation, but only when I took the phone out of the safety of my jersey pocket. The convenient Garmin handlebar mount was no use. Even if the phone was on the handlebar, however, I did not have a way to follow a pre-defined route. The most I knew how to do was to have it show a track and my current position. The Garmin was closer to a proper satnav. It was able to tell me when to turn, and to show a useful map of the turn as it approached. Attaching the phone to the handlebar is not the only challenges to using a smartphone cycling app for navigation. For example, if I configured it to keep the display ON, how long could I ride before the battery died? Of the various problems I had with the Garmin, the battery on it never died mid-ride. And what if it rained, something that is more common in Yorkshire than sunshine? Could I leave my phone out in the rain? My first Garmin quit after an extended drenching on the roads east of Hull. That is a device designed to be outside! That left me scrambling to find a data signal for my smartphone.